FEBRUARY 2019 UPDATE: Please refer to February 2019 articles on CDIA's Yangon project from CDIA and Far East Mobility. Far East Mobility Commences Yangon Urban Transport Project (2017.12). CDIA Busway, Parking and Pedestrian Facility Plans for Yangon (2019.2). From December 2016 to February 2017 Far East Mobility carried out a preliminary scoping mission for the Asian Development Bank to assess the application of bus priority or BRT improvements in Yangon, as well as related improvements in areas such as traffic circulation, TOD, parking and pedestrian facilities. This resulted in the definition of proposed BRT or public transport priority corridors, with the main focus on a phase 1 BRT corridor connecting Pyay Rd and Insein Road with the central area. There is excellent potential for public transport priority and other urban transport and urban development improvements in Yangon. 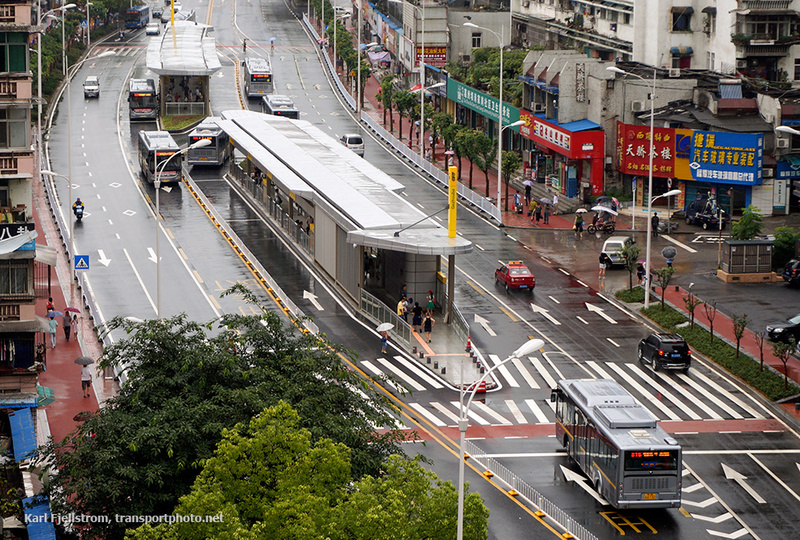 The very high levels of transit ridership and the congestion caused by explosive private motor vehicle fleet growth in recent years mean the potential benefits from a well-planned BRT or bus priority system are very large. The work in early 2017 coincided with the implementation of major public transport system reforms in Yangon. These reforms have led to improvements in bus system operation and organization, but not yet to the extent needed to address the current problems of slow bus speeds and unreliable service. In addition, Yangon has an immensely attractive city centre area with a rich heritage which is being overrun by traffic and related negative externalities such as congestion, noise, poorly regulated parking, crowded and obstructed walkways, unsafe crossings, and other problems. A range of pedestrian facility, parking, traffic management and public space improvements and investments are sorely needed. Ideally these city centre improvements can be undertaken with major bus system upgrades and public transport priority measures. A range of interrelated measures are needed in the city centre area of Yangon. Some important reforms have been carried out to start to modernize bus operations, but bus speeds remain slow and congestion is worsening throughout Yangon. Many walkways in the central area are too narrow and have various obstacles, which combined with poor parking management forces pedestrians to walk in the roadway. Yangon's train system is undergoing much-needed upgrades, but buses will remain the backbone of the transit system for the foreseeable future.